Organize Your VanThe Next Generation of Ranger Design Shelving! 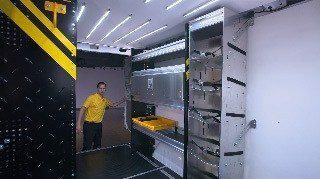 Take your business to the next level by upfitting your commercial van with the most innovative storage solution to hit the market. The new shelving system makes life easier while providing options to customize your work space for your trade. Tested for toughness and rattle‑free, these impressive, heavy-duty shelves will make your mobile office stand out from the rest. 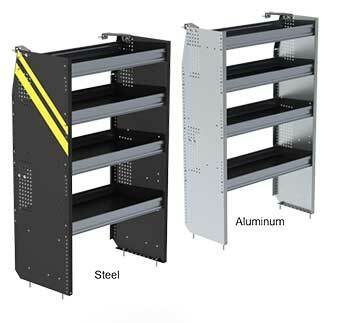 Featuring black powder‑coated steel end panels, this shelving system is created with aluminum extrusions to increase your vehicle’s payload. The shelf trays are built from marine‑grade plywood with a dynamic load capacity of over 200 lb. to carry cargo of any size. With a guaranteed 10‑year warranty, your shelving may even outlast your van! Create the ultimate storage system with our sturdy metal dividers. Infinitely adjustable, they can be placed anywhere on the shelf to keep your tools tidy and in one location. Solid plastic clips hold the dividers tightly in place and eliminate any chance of noise while driving. 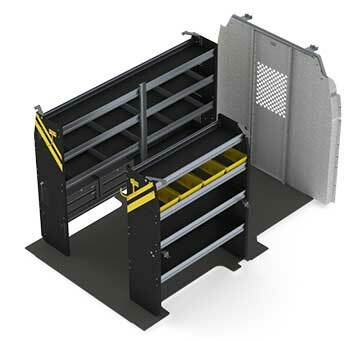 Use these tough ABS bins to arrange your work space neatly for better efficiency on the job. Each bin comes with a center divider and can be upgraded with a set of cross dividers for your smaller tools. Stop searching for free‑range parts by keeping them in a bin that you can carry onto the jobsite. For an extra security measure to safe guard your equipment, accessorize with sturdy, aluminum, locking doors that can be attached easily to your shelving unit. It’s a great way to protect your valuables, or even just to keep your tools on the shelves during the ride to work. 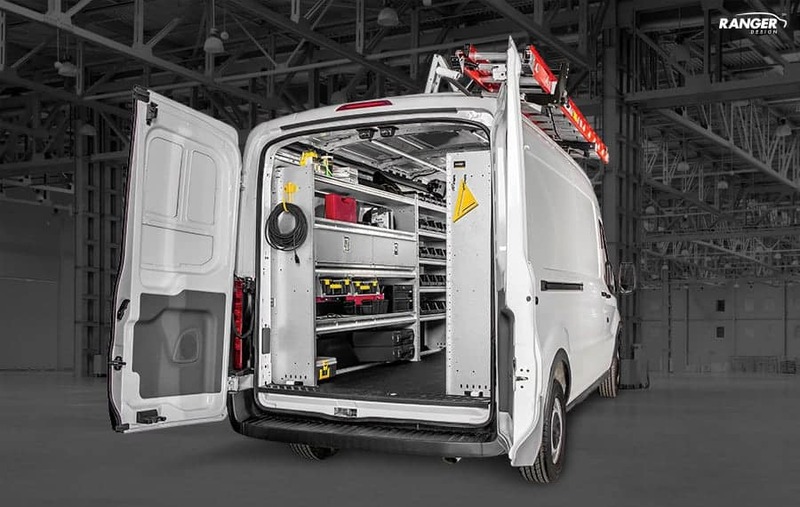 Optimize your vehicle’s cargo area and turn it into the perfect workplace with a pre-designed steel package. Each package includes an impact‑tested safety partition for maximum protection in case of a crash. The following packages have been engineered with a specific job in mind to make optimal use of your available space. For an upgrade, get a top‑of‑the-line aluminum package. With an increased payload, the aluminum package optimizes fuel economy by decreasing the overall van mass. It also reduces vehicle maintenance and repairs caused by weight overload. Ready to choose an upfit to suit your commercial needs? 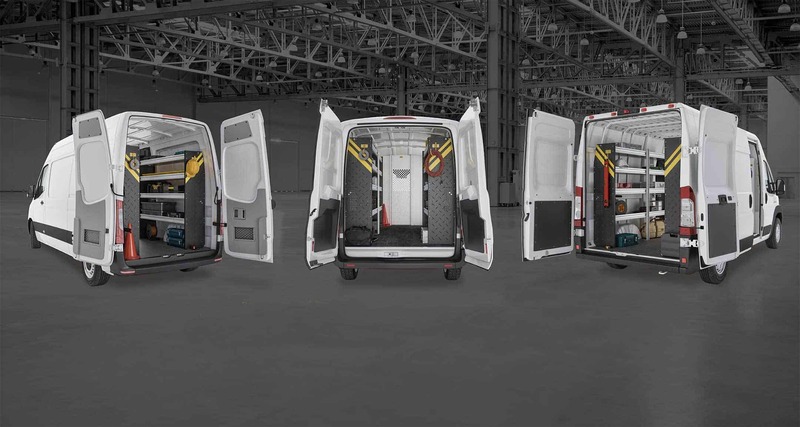 Find the perfect fit in our series of catalogs that present the best solution for every van and trade. Need your new shelving installed in your vans? Our world‑class network of distributors are always ready and willing to help. 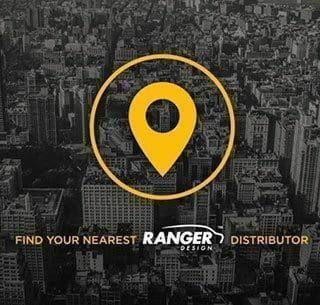 Find your closest distributor today and schedule an installation! Treat yourself to Ranger Design’s New Shelving and find the perfect fit for your toughest job!